You use your oven all the time, but how often do you really clean it? I mean, it stays pretty clean if you remember to use the self cleaning option at least once a month, but it hasn’t been cleaned in 6, 12, 18….or who knows how many months — you might need to give things a good old scrubbing! Now there are a few products we will need to get the job done right and a few precautions we will want to take to ensure nothing gets damages, but we are going to show you a great way to clean your oven without breaking your back! If you want the stick with the “easy way” and don’t mind using chemicals in your oven, you have a few options pertaining to the products you choose. There are specialty oven cleaners that do a great job, you just need to take a few safety precautions to ensure nothing gets damaged. We try to stay away from the “super hash” products to make sure nothing gets damaged. 1.) Gloves – You can pick up gloves from just about anywhere, but the thicker ones tend to work a little better and hold up when doing an oven cleaning. 2.) Cheap Microfiber towels or Paper towels – Cheap microfiber towels are usually easy to get your hands on, but paper towel or “shop towels” will also get the job done. Just don’t get super expensive towels because you might need to throw them away if your oven is extremely dirty. 3.) 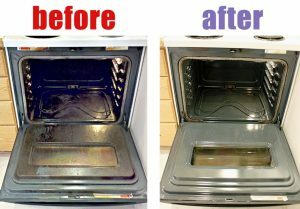 Pumice stone or microfiber sponge – This will help you get rid of any buildup in your oven. 4.) Trash bags – I know we didn’t choose any harsh chemicals for this, but goo gone and easy off can still damage your counter tops or floors. Make sure to have a few trash bags on deck and put your dirty paper towels or microfibers directly in the trash bag when you are done. Alright, we have all of our products, now….. The hard part is done and we have accumulated all of the necessary products to get the job done. We got all of these products for a specific reason, so let’s talk about the process! Step 1.) Wipe the oven to get rid of any loose crumbs, etc. This helps you target the areas that actually have buildup and makes your job easier. Step 2.) Spray your oven cleaner. You will want to spray your oven cleaner all over and then let it sit for a couple of minutes. Step 3.) Tackle any buildup with your pumice stone or microfiber sponge. The cleaner should loosen everything up and make this process pretty simple. If there is a stubborn area, you should apply more cleaner, let it sit, and repeat. The key is to let your product to the work and gently clean with your pumice/sponge. Step 4.) Wipe oven with microfiber or paper towels. After everything is done, you will have to wipe everything down with your towels. Throw them in the trash bag and…….YOU ARE DONE! I hope these simple tips can help you clean your oven without breaking your back! If you rather have someone else clean your oven, you can always hire an awesome cleaning company like maids 2 match!